This solar newsletter was originally published on February 9, 2018. 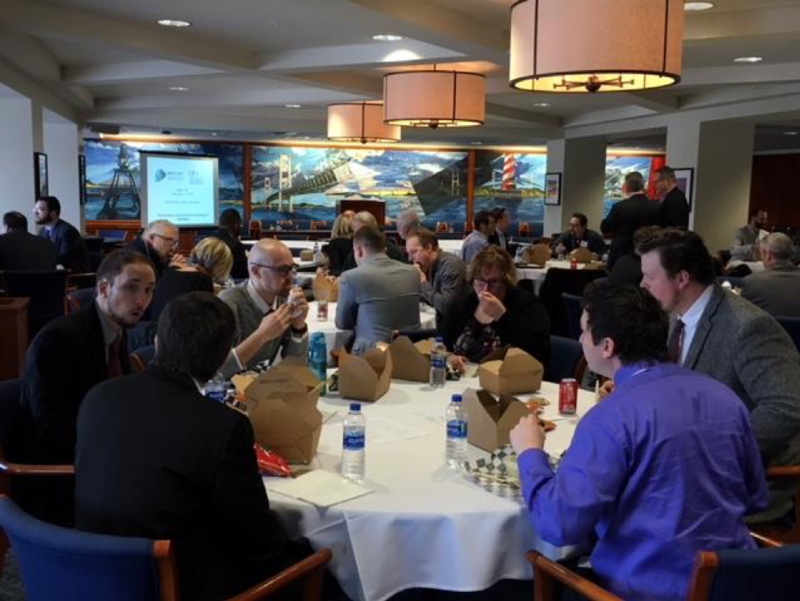 On Tuesday, February 6, the Institute for Energy Innovation (IEI) and Michigan Energy Innovation Business Council (Michigan EIBC) hosted an educational “lunch and learn” event focused on solar energy (“Solar 101”) for legislators, legislative staff, and Michigan EIBC member companies. Liesl Eichler Clark, president of IEI and Michigan EIBC, served as the moderator of the panel with Michigan EIBC member companies Hemlock Semiconductor (represented by Phil Rausch), Cypress Creek Renewables (represented by Kevin Borgia), and The Green Panel (represented by Mark Cryderman) rounding out the panel. Clark kicked off the panel discussion with an overview of energy markets and the recent significant cost declines in wind and solar energy. Clark explained that until recently, increases in GDP in the U.S. were associated with complementary increases in energy demand. In other words, as the economy expanded and GDP increased, Americans used more energy. Recently, however, primarily due to increased energy efficiency, GDP has become decoupled from energy demand – although the U.S. GDP is increasing, energy demand is flat or declining. Along with declining demand, the costs for renewable energy have been dropping rapidly over the last decade. Low, stable costs are creating increased demand for renewable energy among corporations. For example, Michigan EIBC member company Switch operates a data center in southwest Michigan with a goal of 100% renewable energy through Consumers Energy’s green power tariff. After Clark’s introductory comments, the panelists spoke about their work in Michigan and answered questions from the audience. 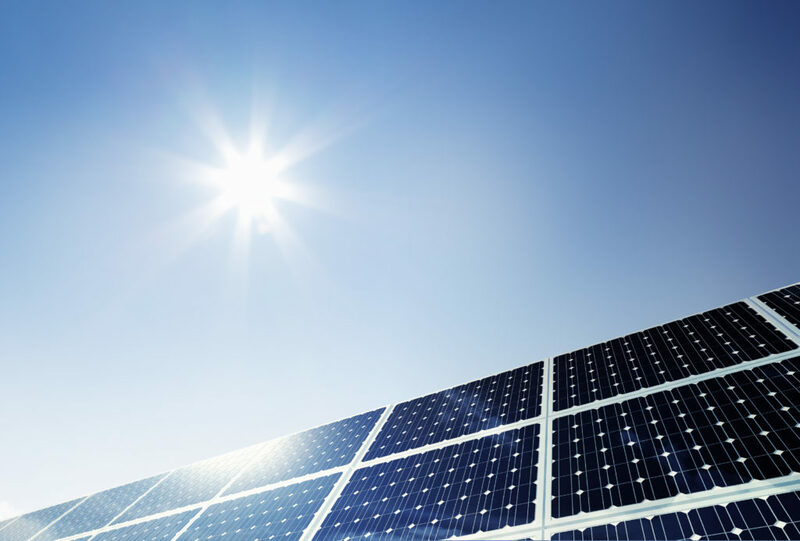 Phil Rausch of Michigan EIBC member company Hemlock Semiconductor – a supplier of nearly 10% of the world’s polycrystalline silicon used in solar panels – explained that the industry has been “booming” since 2010. Rausch boasted that the industry had seen an average growth of 10-12% per year since 2010, well above inflation. Kevin Borgia of Michigan EIBC member company Cypress Creek Renewables – a large utility-scale installer– explained that Michigan is a prime market for increased large-scale solar investment, due in part to the passage and implementation of the 2016 energy legislation (PA 341 and PA 342). Borgia explained that Cypress Creek leases land from farmers, installs solar panels on site, and sells that energy to utilities and corporate purchasers. In these deals, the farmer not only makes money on the lease, but the planting of low-level cover crops improves soil health. The final panelist was Mark Cryderman of The Green Panel, a Michigan EIBC member company that installs small-scale residential solar panels. Cryderman explained that solar is a “disruptive technology,” meaning that the cost of installation has dropped so drastically that the energy industry is fundamentally changing. Cryderman expressed that the benefits of solar installation extend beyond the payback customers receive. Solar provides more stable, fixed energy costs over time, acting as a hedge against inflation. Cryderman explained that the initial residential installation in Michigan typically costs between $2.50-3.00/watt. Under the current net energy metering system, these costs can be recouped by homeowners over a period of about 8 to 8.5 years. After a new report finds that the U.S. solar industry lost 9,800 jobs between 2016 and 2017 due to policy uncertainty and a slowdown in established markets. Advocates worry that changes in federal policy and local regulation could further slow the burgeoning industry. At the federal level, a recent decision to impose tariffs of up to 30% on imported solar panel parts has created uncertainty within the industry. Many advocates worry the tariff will result in higher prices for solar installations, which would decrease demand and hamper job growth. Others suggest that the tariffs will have a minimal impact, or even benefit the U.S. solar industry. Due to the uncertainty about the impact of tariffs, many installers have been stockpiling product. The current net-metering program allows utility customers to sell power generated beyond their home’s needs back to the grid at retail prices. The program will be replaced with a tariff system that is currently being developed by the Michigan Public Service Commission. This uncertainty has temporarily slowed the industry, but any customers who enter the DG program during this interim period may continue to net meter for 10 years from the date of their enrollment. More than 80% of Michigan voters across party lines favor increasing the state’s use of solar energy, according to a recent poll. Michigan Technological University’s Sustainability Demonstration House will soon run on a new solar panel installation. President Trump’s administration should use proceeds from the new solar tariff to invest in a giant American factory to manufacture solar panels, says Jigar Shah, president and co-founder of Michigan EIBC member company Generate Capital. Analysis has been completed for Michigan EIBC member company Geronimo Energy’s 20 MW solar-farm proposal in St. Joseph County. Michigan EIBC member company Hemlock Semiconductor calls on the Trump administration to reopen China to the trade of its polysilicon products. A solar farm in Elkton is progressing. Officials in Ann Arbor amended local zoning rules to prohibit ground-mounted solar panels in front yards. A 15-acre solar array is on the list of Washtenaw County issues in 2018. Upper Peninsula groups are seeing a larger role for solar energy and energy efficiency programs. Zoning could delay the expansion of solar projects in Elmwood Township. The Michigan Agency for Energy and Michigan Public Service Commission announced the release of their newest consumer Tip, Personal Property Tax Exemption for Solar Panels. The document describes an existing tax exemption that can be utilized by property owners to exempt small-scale solar projects, including many systems used by homeowners. However, despite this document, questions remain among local assessors and additional clarity is needed. Solar policy developments last year led to deeper insights about the value of solar and a better understanding of distributed energy, according to an annual review. The new federal tax plan could give a boost to commercial solar installations by reducing the corporate tax rate and expanding depreciation allowances. Solar trade case petitioners Suniva and SolarWorld sent a letter to President Trump, thanking the President for understanding “the seriousness of the problem” of cheap solar imports. Greentech Media lists 10 Trends That Will Shape the Global Solar Market in 2018, and 5 Utility Dive experts predict what 2018 will bring for the solar industry. States across the country are tackling questions around solar energy policies. The U.S. South is defying the nation-wide solar slowdown. Michigan EIBC member company AES Solar discusses the advantages of using solar and batteries to live off the grid. A solar-powered hybrid heat-and-electric system tested in Illinois could someday have uses in microgrids, energy storage, and large commercial applications. Kauai, Hawaii, can generate 100% of its electricity from the sun on clear days. PosiGen LLC won 80% of Louisiana’s rooftop solar market by targeting the low-income neighborhoods that other installers avoided. The NAACP will install solar panels on households and community centers and train 100 people in solar job skills. Tesla will roll out spaces at 800 Home Depot stores to promote its solar panels and Powerwall battery. The executive director of the International Energy Agency says solar energy is “on track” to become the cheapest source of electricity. The Rocky Mountain Institute says modular, preassembled solar products could cut costs by up to $0.20/watt over the next 12 months. Advancing Women in Energy (AWE) invites you to a reception and conversation with Katherine Hamilton, Chair of 38 North Solutions and Energy Gang Member. The reception is Thursday, February 15, from 1pm-3pm in Ypsilanti, Michigan. Become a member and register here.